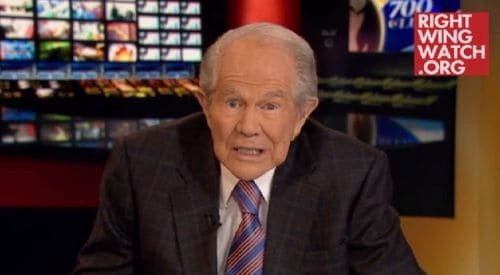 Right Wing Watch reports that in his latest effort to carry out God’s work, Pat Robertson has said that gay teenagers have been either “recruited” into homosexuality or molested. Responding to a 700 Club viewer who asked what he should do after finding a “gay magazine” in his son’s bedroom, Robertson helpfully explained that "so-called gay people have been either attacked or molested by some authority figure or else a magazine or something has confused them." Last December, Robertson said – and he wasn't joking – that gay people will die out because they can't reproduce.